Egypt's Population Surges Past 90 Million, Straining Resources Of A Poor Nation : Parallels The economy is not growing fast enough to keep up. A mother of nine children talks about her failed efforts to control her family's growth or provide for her kids. 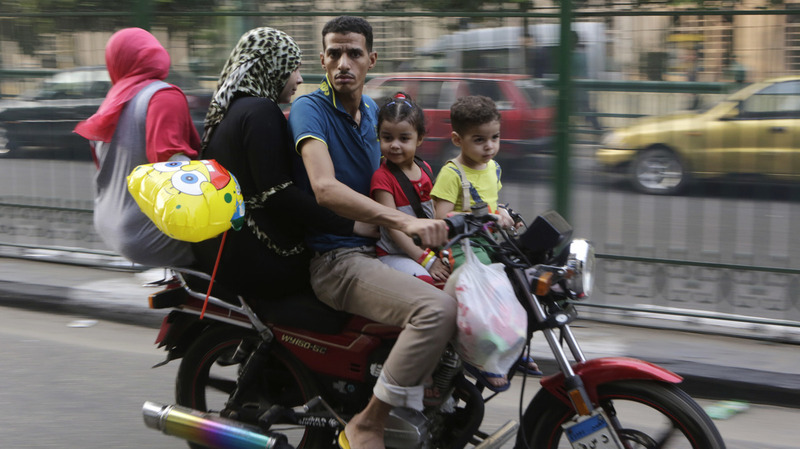 An Egyptian family squeezes onto a motorbike in Cairo in this 2014 photo. After falling for decades, the country's birthrate has been rising in recent years. Egypt now has more than 90 million people, more than twice as many as any other Arab nation. An electronic billboard hangs on the side of a towering government building in eastern Cairo, the home of Egypt's statistical agency, CAPMAS. In an alarming red, the billboard ticks off the estimated number of Egyptians, and on a recent day it said there were more than 91 million. Or 91,034,024, to be precise. Egypt has long been the most populous nation in the Arab world, and is more than twice as large as the second biggest Arab state, Algeria, with around 40 million people. And with Egypt's numbers growing by close to 2 million a year, analysts are sounding the alarm about the strain this places on the country's limited resources. Mudriyah Osman's family shows the dire nature of the country's surging population. She can't read or write. She lives below the poverty line, like more than 26 percent of the country, and she and her husband can't support the nine children they have. At the tiny, one-room apartment she's renting with six of her children and her sick husband, her youngest son was crying, while his sister changed his diaper. The family gathered on two dirty blankets in the apartment, which was infested with flies. Two children are living with extended family in the rural countryside, where Osman's family is from, while she stays in Cairo for medical treatment. One of her sons, who has mental disabilities, is lost somewhere in Cairo. She is searching for him. Osman is not working, and neither is her husband. She says they live off charity. The landlady is constantly after her for rent. "When I had the oldest children, my husband was working as a driver and we had a nice life," she says. In northern Egypt, where she's from, large families are encouraged as blessings and assets. But Osman wanted only three or four children, she says. The rest were conceived by accident — she says she was using birth control and it didn't work. It's hard to imagine how Osman's children's lives will be any better than her own. None are in school, and just like their parents, they can neither read nor write. In Egypt, the number of births had been dropping, until about a decade ago. In 2008, each woman had an average of three children, and in 2014 that number jumped to 3.5, according to the government's demographic and health survey. The population has risen by some 20 million over the past decade, according to Hassan Zaky, a demographer who consults with the National Population Council. "The current size of Egypt is the combined population of Morocco, Saudi Arabia and Yemen," he says at his office at the American University in Cairo. He notes the grim factors contributing to the growth: nearly a quarter of Egyptians are illiterate, and that rate is even higher among women. There's a direct link between a lack of education and a lack of active family planning. Meanwhile, Egypt's economy is not growing fast enough to keep up. "Any increase of economic growth is swallowed by the fast increase of population size. So people do not feel any improvement," he says. In an attempt to make ends meet, many poor families send their kids to work instead of school. It's a recipe for unrest, says Zaky. There are more mouths to feed, more services are needed, more people are angry that life isn't getting any better. Overpopulation is the biggest threat to Egypt's future, he believes. The government, which critics say isn't doing enough, is attempting a new approach under the deputy minister for health and population, Dr. Maissa Shawky. "We are making it clear that when you have one or two children that are healthy, educated, able to stand up high for themselves in the future and to have good family and strong families in the future, you're going to be proud of this," she says. Egyptians often complain about a lack education and health services, but Shawky says families must also consider the number of kids they are having. "With each birth, you have to cover all the needs that are offered from the government, like education, health services, all services in the community," she says. Now, Shawky says the government is increasing access to family planning, including injectable birth control. She's coordinating the work of family planning organizations and is ramping up public education campaigns and family counseling. By 2030, she says, she wants the birthrate to show Egyptian women going down from the current average of 3.5 to 2.4 children. "I think it will be very possible when people feel the pleasure of having one or two children," she says.